I have been waiting to try this place since I first heard about it in October, but the weather just hasn't been right. This is one of those restaurants that only works at certain times of the year. 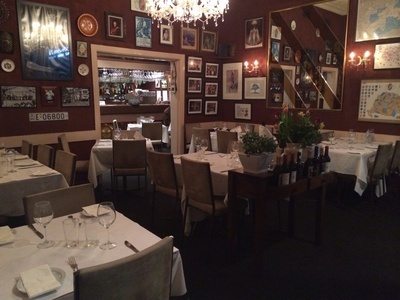 Finally, on a clear and cold May night, I got the opportunity to go to Corner 75, a traditional Hungarian restaurant in Randwick that delivers rich, warming and delicious food, and it does it with style! The restaurant is just beautiful. Dark wooden tables are laid with white tablecloths and napkins; deep red walls are adorned with photos, paintings and other artefacts representing a Hungarian heritage; a white lace curtain hangs half way up the restaurant's glass frontage blocking the street-scape and the whole place is bathed in the warm, golden glow emanating from the gorgeous chandeliers that hang down from the ceiling. The whole atmosphere is finished off with the soft sweet sounds of some classic Eastern European music. Anyone for Zorba the Greek? Like the decor, the staff were just fantastic. Our waiter in particular was hilarious. With a quick wit and friendly yet quirky demeanour, he made us laugh. He 'told off' my older and (sometimes) wiser cousin who ridiculed my decision to order tea with my meal, defending me by stating that tea was a perfectly acceptable dinner drink and very good for me too. In response to a compliment on the wine glasses, he offered to have them packaged up for us to take home, and at the end of the meal, when I asked for a doggy bag by saying 'I want all of this' along with hand gestures, he asked if I wanted the plate as well. His interactions with us throughout the night ensured we had a blast. Although I generally like to try specials (tonight they were Barramundi and a mustard roast beef), the regular menu offered way too many exciting options to consider anything else. 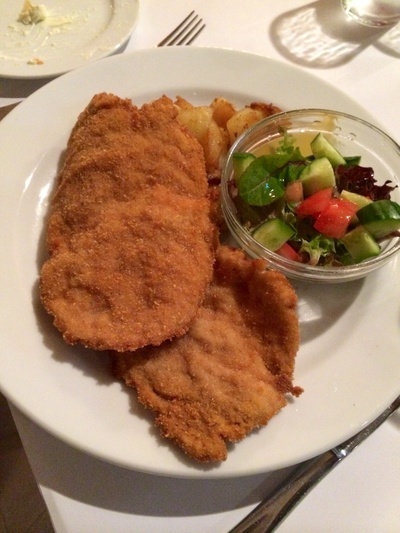 Listed were at least four schnitzel dishes that we could readily identify (they had the word 'schnitzel' in the title); a range of meat and vegetarian goulashes, and several tempting chicken dishes. On a recommendation we started with the Langosh bread ($6.50). 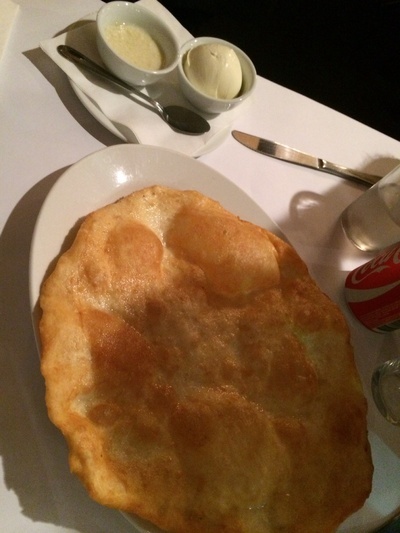 Similar to a naan it was light and soft with a thin crispy outer layer having been fried in the perfect amount of oil. It came with sour cream and a garlic dip that was super strong and tasty - not for the faint hearted or the would be dater. 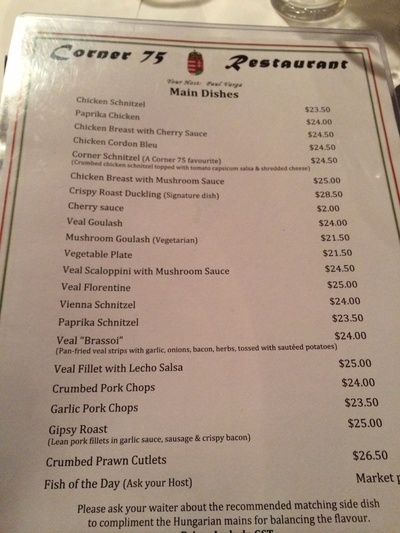 For mains, I was tossing up between the paprika chicken ($24) and the chicken in cherry sauce ($24.50). When I heard that the paprika chicken was half a bird on a plate, I freaked out a bit and decided to go for the dish that sounded more manageable in size. When it arrived, I (loudly) exclaimed "oh wow, how amazing" to which our waiter responded "I'm not that special." He might not have been, but my dinner certainly was. 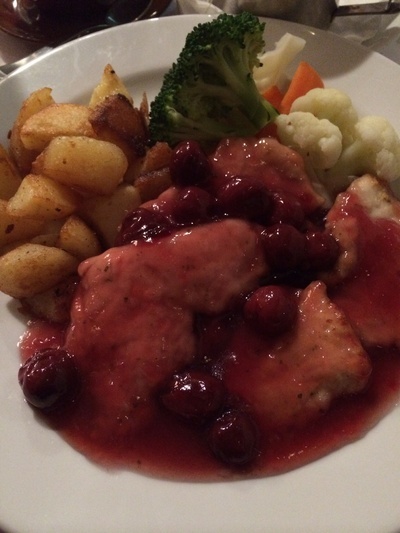 Thin slices of chicken were swimming in a sauce chock-o-block with cherries that were sweet like plum sauce, but had a hint of tartness too. I also loved the little potato gems and steamed veggies that came with it. The others also enjoyed their meals which were all huge, tasty and seasoned to perfection. 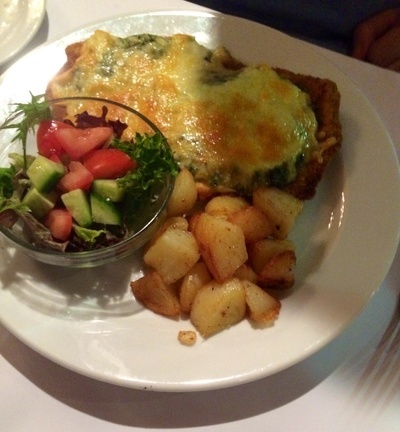 They chose a veal goulash ($24), a Vienna schnitzel ($24) with additional mushroom sauce ($2) and a veal florentine ($25), essentially a schnitzel smothered in a creamed spinach sauce, and then covered in melted cheese. We were all very happy. 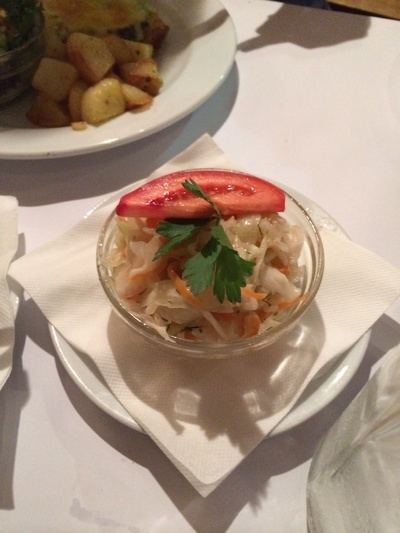 As an accompaniment, we ordered a cabbage salad ($6.50). Served in a (surprisingly) small bowl and sweetly dressed, it was crunchy, light and refreshing - making way for a very pleasant addition. 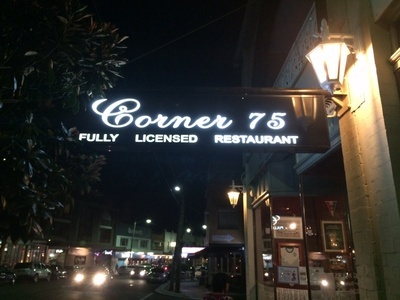 There is nothing more comforting on a cold night than home style, Eastern European food, and Corner 75 is one of the best places in Sydney that I have found to get it. With more meals like this one, I think I'll be staying very warm (and possibly getting very fat) this winter. 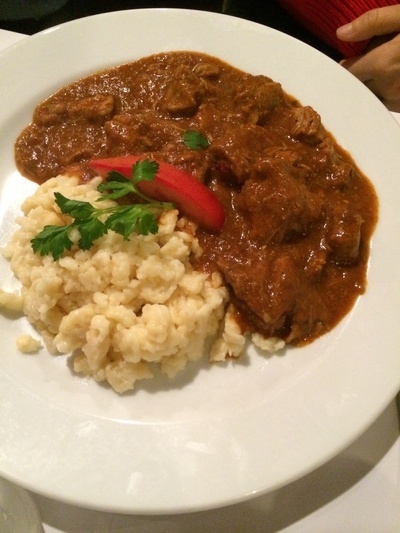 Why: Tonnes of food and tonnes of charm - a delicious and warming food journey to Hungary. Good for kids: Not ideal but they'd definitely accommodate. Are ther anny placeses wher you Can get good old Australien food?